Information & updates from January to April 2018. 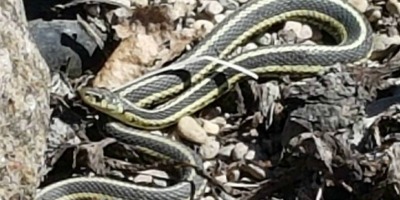 Martin snapped this photo of a gartersnake in his yard enjoying the sun on April 30th. Martin snapped this photo of these Snowbells around noon on Monday, April 23rd. If you look closely you can spot a bee near the middle of the picture. "The bees are going crazy. There are about 100 bees collecting pollen. Their baskets are full." As for the snow... most is gone with a few drifts left. Never a dull moment at the farm. 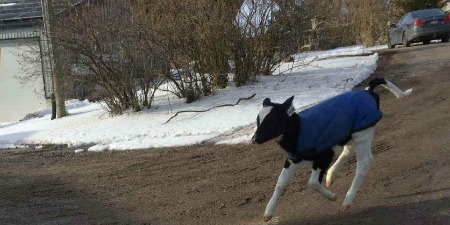 On the morning of Saturday April 21st Martin had to deal with a calf who managed to get out of her pen and out for a run behind the barn and up near the house. Martin's strategy - "You have to be fast, smart and talk very friendly to her... and maybe pretend there is milk on my finger." And he was successful and she was back in her pen within a relatively short time frame. This year we are trying 'strip tillage' in one of our fields. As you can see from the pictures below taken in mid-March, only a narrow strip of soil is cultivated in this oat stubble where we'll plant the corn seeds later on. This requires specialized equipment so we are working with a neighbour who has the needed equipment. Martin snapped this photo when he was out and about in late February. I am seeing this everywhere. We've had a lot of snow and a lot of rain. Soils are either frozen or have become saturated, so the water can't soak in and goes over the top of the soil. When the water runs over the top of the soil it washes the soil out, and ultimately that soil can get washed into waterways. When fields are totally bare and plowed it's a problem. A cover crop or perennial forage such as hay would be good, and reduce the soil erosion. The soil that is getting eroded is the top layer of top soil and organic matter. It has taken thousands of years for our soils to build up. Once they are gone, they are basically lost. It is very difficult to build up soil and organic matter again. It's critical we protect what we already have. Martin took this photo out and about the last week of January. You can see on the snow beside the field that top soil is blowing of the uncovered field. This is what happens when you plough a field and then do not plant a cover crop. The soil erosion is evident with snow, and will continue eroding until the spring when it will be planted. Not only would a cover crop provide protection from soil erosion, it can be plowed under in the spring to compost into the soil, providing nutrients to future crops and building soil organic matter. It's very important to keep top soil in place. A loss of 1 millimetre per year is 1 inch in 25 years and we only have about 6 inches or less as it is. When we posted the above picture about 'Dirty Snow' on Facebook, one of the comments was "...you can no till into the cover crop and forgo the tillage! Tillage disturbs the soil life!" Following are some thoughts from Martin on no till. Sometimes as an organic producer we envy no till farmers, because no till for sure addresses the issues of water and wind erosion. The problem with no till is that it relies on the use of herbicides. Although Roundup worked for 20 years, now farmers are battling many Roundup resistant weeds, and are back to all the old herbicides in order to control these weeds. The organic matter in Ontario soils keeps going down, including in no till systems, with a limited crop rotation and lack of cover crops. Organic farmers do too much tillage mainly because of weed control. 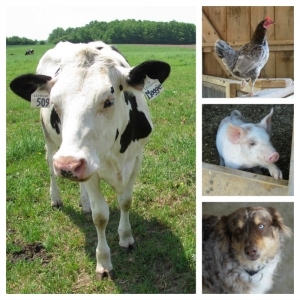 So how can we build a sustainable farming system? A combination of no till, a diversified crop rotation and cover crops, always keeps the ground covered with something that grows. Although we do tillage at Mapleton's to control weeds in our fields, we have a 5 year crop rotation with forages and the use of cover crops (red clover and oats). We have been able to increase the organic matter (OM) in most fields to over 6 %. Having said this we are always looking for ways to do things better. We are trying out strip tillage in an oats cover crop and will use rye as a life mulch cover crop. At the end of the day it is all about soil health and conventional and organic farmers can learn from each other. Martin snapped this great photo mid-January. Rosie loves Arwa and Arwa loves Rosie. Looking for more updates? 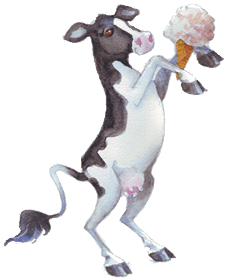 Review our blog menu to the right for other Life on the Farm blogs. We started them in 2017 and have been trying our best to provide updates since then.